OK I admit it, I wasn’t telling the whole truth when I put together the grand title for this dish. It only takes a passing glance at the photo above for you to see that there is a sprinkling of fresh chilli in this dish. It’s totally NOT essential, so if your palate prefers the absence of chilli – or if you are feeding it to little ones, then please omit the chilli part as it still tastes really good. We try and eat fish and seafood a couple of times a week, which reminds me, I must put up another of my squid recipes as squid gets a big thumbs up in our household. My six year old, known as big A in this blog (as she is my eldest daughter) has loved it for as long as I can remember; she is a joy to cook for as she eats and tries everything. She has her sights set on junior Masterchef, way to go girl. This dish is perfect with white fish and cod works particularly well as it does not flake too readily during cooking. This dish is rustic and juicy and has the definite thumbs up from Mr B. 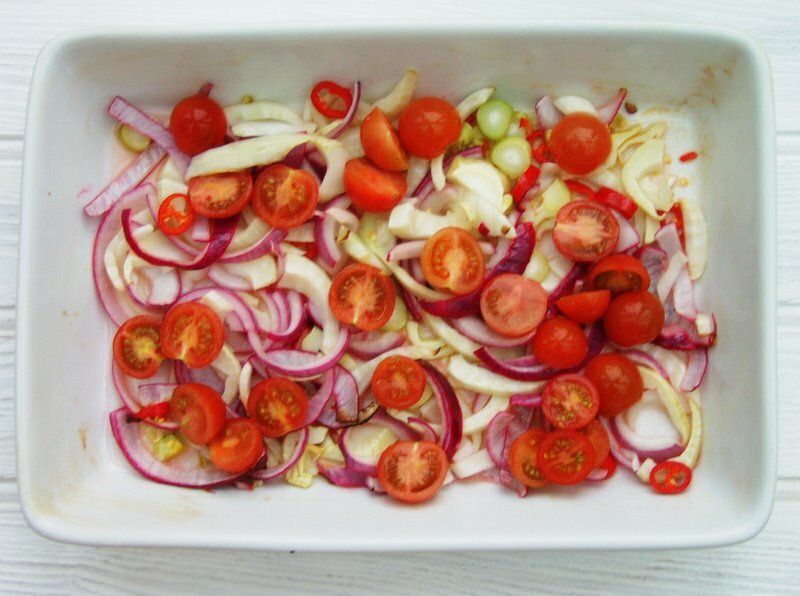 There are a lot of flavours going on in the dish, from the sweetness of the balsamic vinegar, red onions and tomatoes to the subtle aniseed taste of the fennel and the wonderful kick from the chilli. I find they compliment each other so well, I hope you agree. 2. Add the tomatoes and roast for a further 5 minutes. 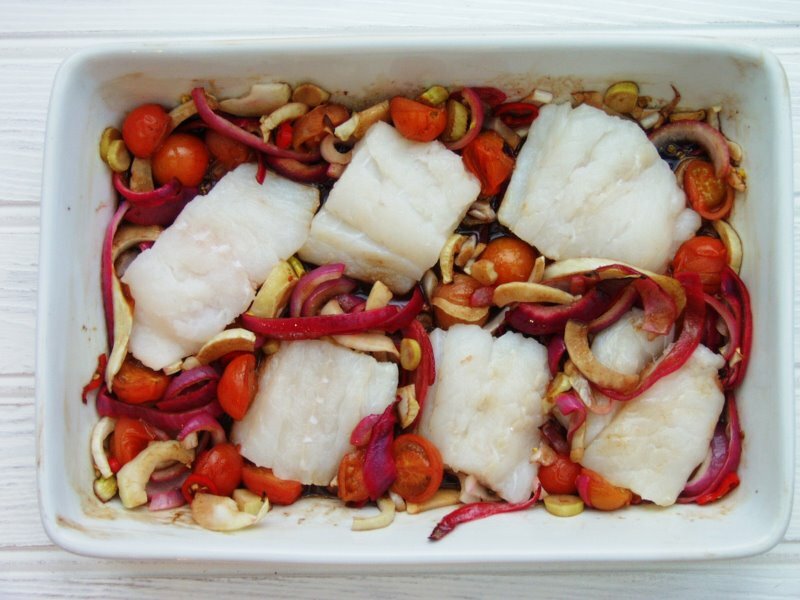 Now place the cod fillets, balsamic vinegar and remaining olive oil on the vegetables and roast for 10-12 minutes. Do not overdo the cooking of the fish as it will begin to dry out. It needs less cooking time than you think! 3. 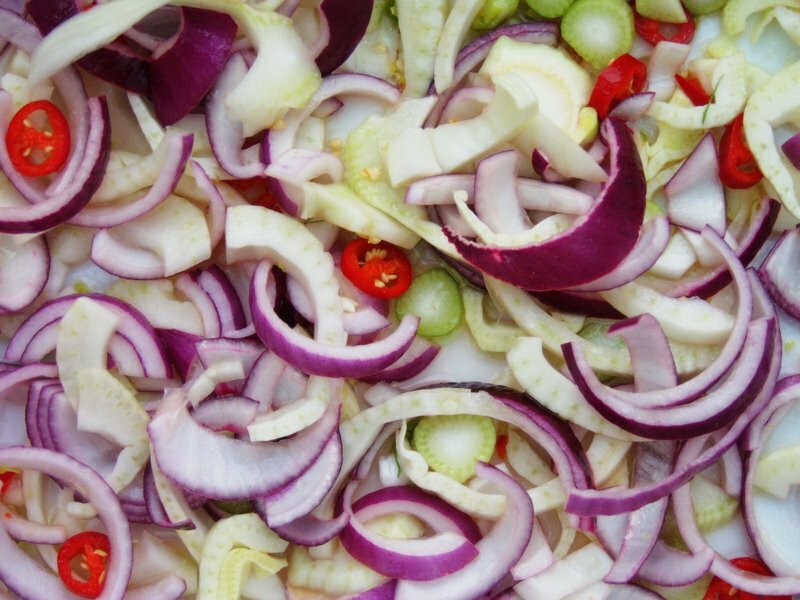 Serve immediately with the fennel fronds scattered on top to garnish. I like to eat this with rice, although it would also work equally well with little cubed roast potatoes. 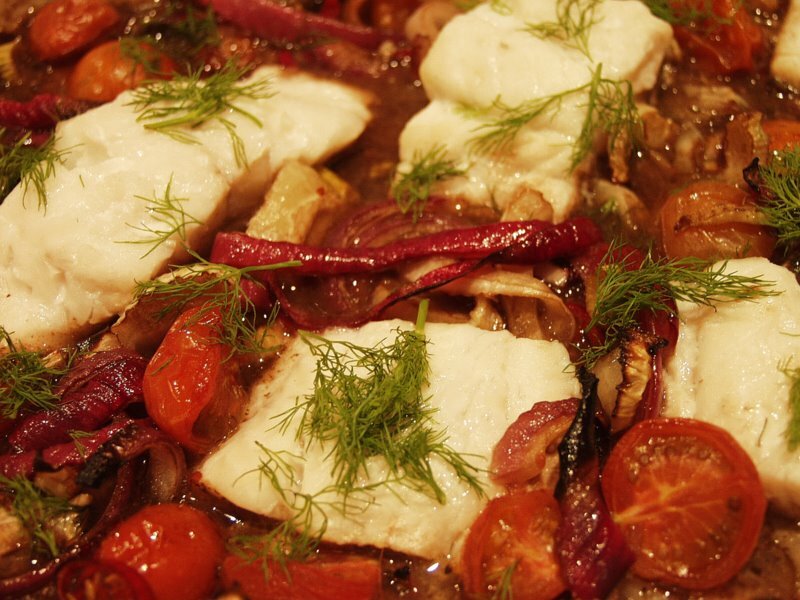 This entry was posted in Fish and tagged balsamic vinegar, cherry tomatoes, cod, fennel bulb, fennel fronds, lemon, red chilli, red onion, white fish. Bookmark the permalink. I have been cooking more fish lately and this recipe looks perfect. I am bookmarking it for next week. Thanks!